You won't believe your eyes when you see how fast you can make a quilt with the technique in 10-Minute Blocks, a quilt pattern book by Suzanne McNeill. Using a 10 minute quilting block, you can make a beautiful bed quilt in just a day! The innovative 10-minute block technique uses a 3-seam sequence of folding and sewing reminiscent of origami to create a large four-patch block with a layered diamond in the center. After stitching the block together, all you need to do is topstitch the diamond to finish the oversized block. Just by pulling and tucking the fabric, you can also create curved, cathedral-window like edges on the diamond, increasing the possibilities for this simple quilt block. 10-Minute Blocks presents two clear, step-by-step tutorials for making the 10-minute block. The first includes color photographs so you can see what the block looks like at different stages in its construction. The second tutorial uses diagrams to help you visualize how you will manipulate the fabrics to create the finished design. Once you have the hang of the 10-minute block technique, you can try one of the seven quilt patterns included in 10-Minute Blocks. Each quilt pattern uses a different combination of fabrics and arrangement of 10-minute blocks to create a unique design that you can make in just a day. Whether you want to make a baby quilt for an upcoming shower or a king size quilt for your master bedroom, you'll find a quilt pattern in 10-Minute Blocks that perfectly fits your needs. The book provides basic assembly instructions for simple throw quilts, double quilts, and king quilts. Each of the seven quilt patterns then includes fabric requirements for the three separate sizes. Several of the patterns also include fabric requirements for a smaller baby quilt size as well. With a basic knowledge of the 10-minute block technique and the quilt designs in this book, you can make a quilt for any room in your house or any occasion! The quilt designs in 10-Minute Blocks range from earthy throws to cheerful baby quilts, with everything in between. Substitute your favorite fabrics for the ones listed in the quilt patterns, and the possibilities of these quilt designs are endless! Although most of the quilt patterns are incredibly simple, incorporating just the basic 10-minute block into beautiful designs, some of the quilts also involve more complicated piecework for quilters who like a challenge. 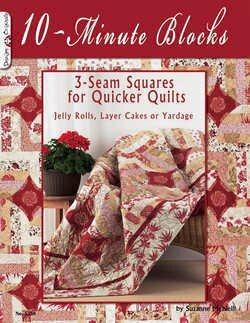 I'm especially fond of the Floral Fire quilt, which replaces the plain fabric squares in each four-patch with rail-fence blocks. The finished effect could not be more attractive! The Hearts a Flutter pattern also puts an interesting spin on the 10-minute block method, adapting the technique to create geometric heart blocks that are perfect for Valentine's Day, wedding showers, and more. If you've been intimidated by the prospect of making a full-size quilt, 10-Minute Blocks is the quilt pattern book for you. With the 10-minute block technique and the seven original designs in this book, you'll be able to make a king size quilt in just a day! I ve been looking for this book. How do I purchase it? I am doing the 10 minute block now. It is very clever, but when you start it will take you more than 10 minutes, but is is still quick. It takes a few minutes to figure out how to get the third seam with the diamond just right. For some reason there is always one end where you fight to not get a pucker in the diamond. There is probably an easier way, I just have not been able to figure it out. Great design and well worth giving it a try. I saw this book at a quilt show. I paged throught it. I would love to add it to my library. 10 minute blocks is a nesscitiy when your busy and they a great looking. im new so can someone please tell me how to download the free 10 minute blocks ebook ..... I've added it to my basket and done everything I could think of ....any help would be appreciated. Hi CountryGirl and aprillester82! Unfortunately, this book isn't available for a free download; this is simply a review of the product. For purchasing questions, please go to the Design Originals website. Good luck! Very clever and I especially like the 10-minute technique idea. Sounds exciting. I find a ten minute block very intriguing. Would love to put together a quilt in a cuople of days. Just the kind of book I need to get me started on a quilt....nothing too complicated and something to keep my interest peaked.